DMMTM is Reagent for activating carboxylic acids in solution and solid phase peptide synthesis; superior or comparable to the most popular coupling reagents. DMTMM does not require pre-activation of the carboxylic acid. The coupling efficiency in SPPS was found to be comparable to PyBOP while racemization could be kept below detection limit. M. D’Este, D. Eglin, and M. Alini Synlett, 2000, 2, 275–277. C. Loebel, M. D’Este, M. Alini, M. Zenobi-Wong, D. Eglin C. Loebel Carbohydrate Polymers, 2015, 115, 325–333. 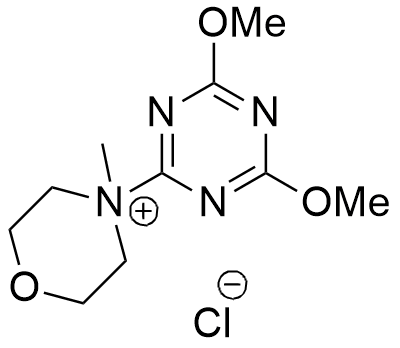 J. M. Pelet and D. Putnam Bioconjugate Chem., 2011, 22, 329–337. K. Hojo, M. Maeda, N. Tanakamaru, K. Mochida, and K. Kawasaki Protein & Peptide Letters, 2006, 13, 189-192 189.